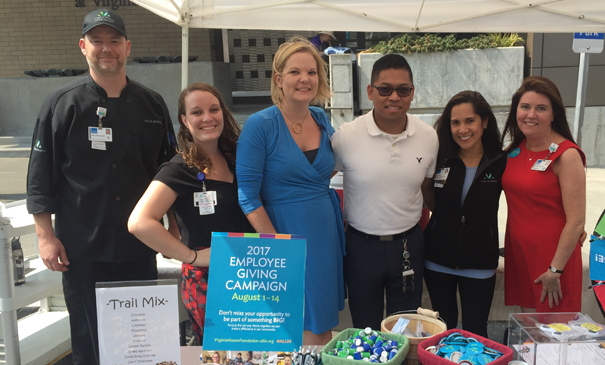 Team members at Virginia Mason, Benaroya Research Institute and Bailey-Boushay House give of themselves every day working to improve people’s lives. But they also want to contribute through donations and volunteering. The Employee Giving Campaign offers a chance for them to make an enormous difference in the community. Sweet Charity Fund—a fund to support Virginia Mason patients and their families who need to cover the costs of their care that isn’t covered by insurance. Food Bank and Homeless Program at Bailey-Boushay House—this program provides clothing and food for many homeless clients as well as support to obtain and keep housing. Innovative Equipment at Benaroya Research Institute – a fund to purchase a fast, accurate and efficient robot to help accelerate research into autoimmune diseases. Patient Experience at Virginia Mason – supporting the Patient Resource Center which provides support groups, assistance with clinical and insurance processes, essential items for hospital patients and more. United Way of King Country – gifts to support ending homelessness, helping children prepare for kindergarten and building financial stability for low-income families.